Successful innovation projects require an adequate innovation management capability in organisations. This means a sufficiently rigorous, continuous, and goal-oriented management of innovation processes. The literature research demonstrates that an integrated innovation methodology requires highly qualitative processes that are both flexible and customer-specific in their design. This work focuses on the FuGle® innovation process model, which is applied at the Industrial Engineering Department of Stellenbosch University. The enhanced FuGle® innovation process model presents flexible processes that are supported by methods and techniques that guide the user to drive innovation projects. This paper presents an innovation approach that enables organisations proactively to manage customer needs and trends. Thus the enhanced FuGle® innovation process model aims to turn an innovation project into a marketable product. Suksesvolle innovasie projekte vereis 'n voldoende innovasie bestuursvermoë in organisasies. Dit beteken 'n deeglike, deurlopende en doelgerigte bestuur van innovasie prosesse. Die literatuur navorsing toon dat 'n geïntegreerde innovasie metodologie vereis hoogs kwalitatiewe prosesse wat beide buigsaam en kliënt-spesifiek ontwerp is. Hierdie werk fokus op die FuGle® innovasie prosesmodel, wat toegepas word by die Departement Bedryfsingenieurswese van die Universiteit van Stellenbosch. Die uitgebreide FuGle® innovasie prosesmodel bied buigsame prosesse wat ondersteun word deur metodes en tegnieke wat die gebruiker begelei en in staat stel om innovasieprojekte te dryf. Hierdie artikel bied 'n innovasie benadering aan wat organisasies in staat stel om kliënte behoeftes en tendense pro-aktief te bestuur. Die doel van die uitgebreide FuGle® innovasie prosesmodel is om 'n innovasie projek te omskep in 'n bemarkbare produk. Innovation is an essential element for creating and assuring competitive advantage, and is a necessity for any organisation's economic sustainability. In 1911, Schumpeter demonstrated that innovation-orientated companies ensure economic development better than those that do not have such an orientation [1,2]. About 100 years later, Disselkamp stated that only those organisations that repeatedly gain new competitive advantage by innovation will be able to enjoy long-term survival in the market . Kaku pronounced that innovations and discoveries will change the economic, political, and social landscape, displacing cherished beliefs and prejudices . Even though innovation concerns every individual's life and plays a crucial role in organisations, the majority of new developments do not achieve market maturity . Christensen also noted the high failure rate of new products launched on to the market . The failure of such a high number of innovation projects may result from internal structures, despondency, and lack of knowledge of innovation management . Disselkamp stated that the main problem for innovation is usually an inadequate management of innovation . This means a shortcoming in sufficiently rigorous, continuous, and goal-oriented management and administration of innovation organisation and processes . This paper is based on the FuGle® innovation process model, which was developed by Indutech  and is currently applied at the Industrial Engineering Department of Stellenbosch University. The purpose of this work is to enhance the FuGle® innovation process model in order to maintain competitive advantage for organisations by increasing the success rate of innovations. An extensive literature review was conducted in which various innovation process models were identified. For this research, only meaningful studies were eligible for inclusion in the review if they met the minimum requirements, such as relevance and credibility. The literature of academic institutions and of economic enterprises is included, as the focus was on studies published by universities and research centres. Research papers are included if the latest revised edition has been published since 2000, even if it was initially published before then. The literature is included if it presents a generic innovation process focusing on product innovations. The models are briefly described below. The stage-gate process covers product innovations, from ideas being generated until the launch on to the market [7,8]. The stage-gate process typically includes five stages in addition to the 'discovery stage' (stage 0): 'scoping' (stage 1), 'build the business case' (stage 2), 'development' (stage 3), 'testing and validation' (stage 4), and 'launch' (stage 5) [7,8,9,10]. Each stage is followed by a gate, where a go/kill decision is made whether to continue or to withdraw from the innovation project . The collaborative innovation (CI) process focuses on the conceptual design using an integrated pool of techniques such as 'quality function deployment' (QFD) . The CI process consists of five main steps, including 'value modelling', 'focus', 'innovation', 'evaluation & selection', and 'risk-reduced development planning' (RRDP) . As stated by Eversheim, the W-model is a process model focusing on developing technical product innovations . It has seven steps. The model addresses strategic aspects from the bottom up and operational aspects from the top down. The seven steps of the process model are 'goal setting', 'future analysis', 'idea generation', 'idea evaluation', 'detailing ideas', 'concept evaluation', and 'implementation planning'. This systematic approach of the process model includes product planning tools and techniques to increase innovation capability . The W-model can be used in multiple ways by making use of the different application areas and characteristics of each step . The operational strategy consulting firm Breakthrough Management Group International (BMGI) has developed an innovative infrastructure called 'A tale of two cultures' comprising two main cycles: 'front end innovation' and 'back end exploitation' . Front end innovation focuses on defining the opportunity and generating the ideas through discovery. Valuable ideas will be designed and further developed [13,14]. Once the design is developed into a solution concept, its feasibility has to be demonstrated to ready the solution for launch. By repeating the front end innovation cycle, deeper knowledge will be built up . The back end exploitation is a linear systematic product design approach that is based on the thoughts of the stage-gate process, and comprises the development and commercialisation of new solutions . The last point of the back end exploitation includes the improvement of the new solution . The two-part innovation process is based on the studies and experiences of Gassmann and Sutter . This generic innovation process consists of two main parts called the 'cloud phase' and the 'building phase'. The cloud phase focuses on the early innovation phase, which requires creativity, a lot of time, and relatively low cost. The building phase, by contrast, is cost-intensive and a more structured process . Define, measure, analyse, design, verify (DMADV) is a 'design for six sigma' (DFSS) methodology that concentrates on both the development and the process of innovation projects . With regard to the objective and scope of this work, the focus is on the development of innovations. According to Lunau et al., the DFSS approach reduces the risks of development projects . The DMADV methodology consists of the phases 'define', 'measure', 'analyse', 'design', and 'verify'. Before the process of the DMADV methodology starts, an initial 'scout' phase identifies suitable innovation projects . The survival-of-the-fittest model is based on Darwin's evolutionary theory; this means that ideas compete for the limited resources (e.g., budget and time) of the organisation in order to survive [17,18]. The survival-of-the-fittest model consists of the following steps: 'ideas', 'setup playground', 'sprint', 'evaluate', and 'adapt'. The sprint-evaluate-adapt sub-cycle will continue until the idea turns into a marketable product . The survival-of-the-fittest model includes three key role-players: the innovation team, the innovation master, and the principal. 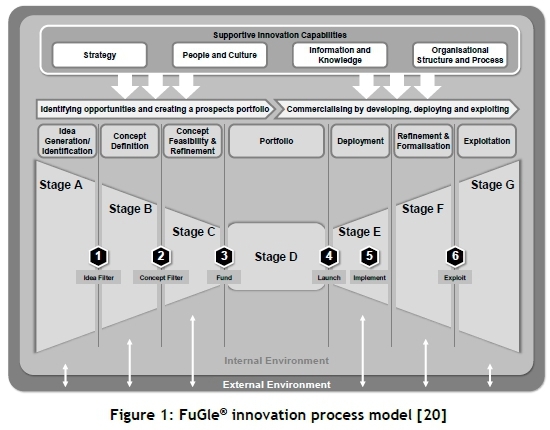 As shown in Figure 1, the FuGle® innovation process model consists of two main parts, the 'funnel' and the 'bugle' . The 'funnel' part identifies opportunities and creates a portfolio of prospects, whereas the 'bugle' part commercialises the innovations. The innovation process is influenced by supportive innovation capabilities such as the strategy of the organisation, its people and culture, organisational structure and processes, and information and knowledge . The whole FuGle® innovation process is linked to the external environment. This illustrates the correlation between the actual innovation process and open innovation, networks, and outsourcing. Collecting, categorising, and presenting information on problems, company strategies and objectives, competitors, and technologies, as well as on clients and markets as essential sources of inspiration for developing new ideas. Generating and collecting new ideas from internal (e.g., employees) or external (e.g., customers and suppliers) sources. Capturing ideas is essential in order to develop new ideas further into a concept, or to document new ideas that could be viable in the future. Idea filter: Filtering new ideas that do not fit the strategy of the organisation. Rejected ideas are documented, including the reason for the rejection. Developing a feasible concept by applying a mixture of different ideas. Incubating and refining concept by discussing it with various persons. Concept filter: Choosing ideas with a promising future in order to determine their viability. Determining feasibility by applying further information such as market and technology information. Developing models and prototypes to assess feasibility in order to refine concepts through iterative approaches. Funding gate: Creating a list of future innovation concepts, including resources for further development. Developing a portfolio of created concepts in order to prioritise, schedule, and align concepts. Managing the portfolio by allocating resources, assigning responsibility, and monitoring potential innovation projects in order to achieve the organisation's strategic objectives. Launch gate: Deciding on the release date of a chosen innovation project. Detailing design and testing of developed specifications and processes and identified business requirements. Implementation gate: Reviewing the design of the innovation project and assessing its maturity and readiness. Operating and refining the innovation in order to ensure that the innovation is functioning correctly. Formalising the innovation through operational documentation. Exploitation gate: Deciding which innovation project should be further exploited. Exploiting the business model in order to generate more value from the solution. 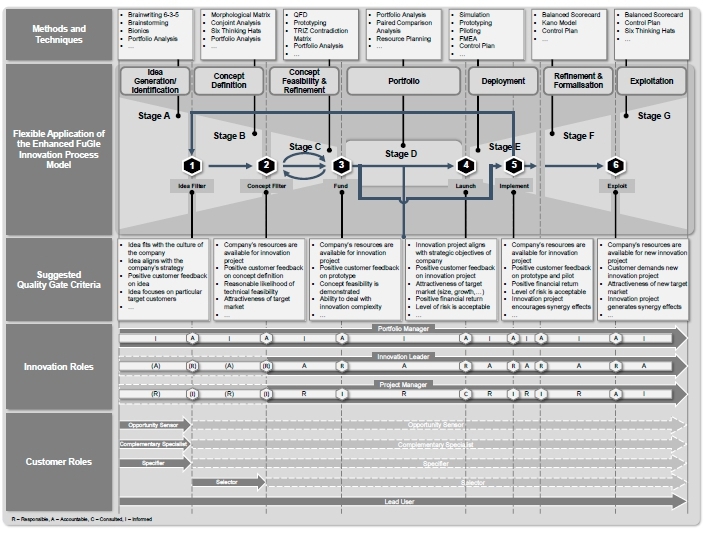 Du Preez and Louw state that the FuGle® innovation process model has "many iterative loops and overlaps between the steps within the different stages", even though the FuGle® is linearly staged . Activities such as generating and capturing ideas may occur concurrently, while other activities such as portfolio management take place all the way through the process. The previous section described some of the innovation process models found in the literature. In this section, these models are compared against three key objectives identified for innovation process models. One of the key objectives is to refine the quality aspects within the innovation process by applying different methods (e.g., QFD and TRIZ) [14,16] and using the approach of integrated quality gates [26,27,28,29,30]. Synchronised innovation roles are also crucial to allocate their responsibilities for each main task and to eliminate overlapping responsibilities and responsibility gaps [16,18,31]. Secondly, the integration of the customer into the innovation process at an early stage is important to promote the emergence of innovations, and thus improve their results . As stated by Doernemann , Meier , and Mueller-Kirschbaum, Wuhrmann and Burkhart , continuous customer interaction throughout the innovation process increases the success rate of innovations. Thirdly and lastly, the flexibility, autonomy, and stability of the innovation process are given by adaptable process interfaces (jumps, loops, and overlaps of its activities) in order to react flexibly to different circumstances, such as the execution of incremental or radical innovations [22,35,36]. The identified innovation process models were then set in the context of these defined objectives. By analysing the innovation process models and highlighting their advantages and drawbacks in comparison with the defined objectives, the requirements for enhancing the innovation process can be derived. The gap analysis is summarised in the matrix shown in Figure 2. It demonstrates the identified innovation process models, differentiated by three key objectives ('quality', 'customer', and 'flexibility'). An evaluation of existing innovation process models is provided using three categories ('completely satisfied', 'partially satisfied', and 'unsatisfied'). 'Completely satisfied' means that an innovation process model responds perfectly to a particular objective. This means the objective is discussed in detail. An innovation process model is classified as 'unsatisfied' if it is not in line with the corresponding objective, or if the objective is missing. 'Partially satisfied' refers to innovation process models that are neither 'completely satisfied' nor 'unsatisfied'; this means that partially satisfied objectives are only met to a small extent - for example, the objective is mentioned but not discussed in detail. 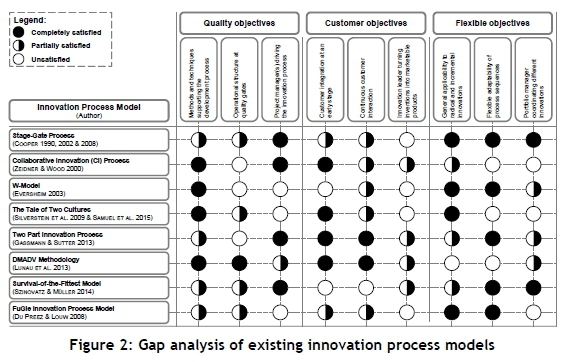 All existing innovation process models identified in the literature reveal gaps that relate to the defined objectives. An integrated model that considers quality aspects, integrates customers throughout the process, includes key roles, and maintains flexibility is still lacking. From a quality perspective, the gap analysis in Figure 2 demonstrates, in the category 'operational structure at quality gates', that less than 13 per cent of the analysed innovation processes are classified as 'completely satisfied', while more than 37 percent are classified as 'unsatisfied'. Moreover, the gap analysis shows that 25 per cent of the innovation processes do not integrate customers at an early stage ('unsatisfied'). As shown in the category 'flexible adaptability of process sequences', more than one third of the innovation processes are classified as 'unsatisfied'. Enabling the flexible application of the model. Considering the requirements derived in the previous section, an EFIPM was developed. The EFIPM components are divided into five high-level areas: the methods and techniques, the quality gates, the innovation roles, the customer integration, and the flexible application. Figure 3 provides a summary of the main findings of the EFIPM and its temporal classification. The methods and techniques of the EFIPM serve as a guideline for the user to develop innovations. However, the methods and techniques make no claim to completeness, and may be expanded individually, depending on the given innovation project. For instance, the introduced model addresses both physical products and non-physical products such as services and applications. Thus the model includes methods and techniques that refer either to physical or to non-physical products. The 'prototyping' method, for example, refers only to physical products, whereas 'simulation' may address both physical and non-physical products [14,16]. For this reason, the EFIPM does not prescribe any methods and techniques. On the contrary, it only proposes methods and techniques that can be used during a particular stage. The EFIPM is also open to other external methods and techniques that are indicated by the 'external environment'. As demonstrated in Figure 3, the EFIPM contains 18 different methods and techniques in order to create a systematic approach that may also include external individual project-related methods and techniques. Each stage comprises at least three techniques and methods, thereby ensuring the support of the user in developing the idea throughout the entire innovation process. According to Becker, transparent processes improve the approach of quality gates. Among other things, transparency is required to adjust processes at any time, according to changing premises [26,27]. Valeri and Rozenfeld state that quality gates should include deliverables, criteria, quality gate results, and corresponding key roles . Hence, the purpose of this section is to establish transparent and standardised processes at quality gates, considering the deliverables, criteria, and gate results. The corresponding key roles for each quality gate are described in the section below. Quality gates are used for quality assurance purposes, and thus set quality standards within an organisation. According to Cooper, a gate is a control system that reviews the previous stage and aims to ensure the desired innovative outcome after each stage . Projects that produce poor results might allowed to proceed. Promising projects might be cancelled. Flohr distinguishes between a 'fixed criteria' catalogue and a 'no criteria' catalogue . The benefits of the 'fixed criteria' catalogue are criteria definitions that require less effort, and a better comparison between the projects . The disadvantages of the 'fixed criteria' catalogue are the complexity of defining criteria that have to be applied to all projects, and a lower acceptance rate . The 'no criteria' catalogue benefits from the fact that the criteria can smoothly match the individual project situation . The drawbacks are that the definition of criteria requires more resources, and that it is more difficult to compare the projects with each other when a 'no criteria' catalogue is used . This is why the EFIPM only suggests quality gate criteria that have to be complemented, depending on the individual innovation project. In a similar way to the stage-gate process, the EFIPM proposes to designate 'must meet' criteria and 'should meet' criteria . The 'must meet' criteria are knock-out criteria that have to be fulfilled, whereas the fulfilment of the 'should meet' criteria is desirable but not obligatory . The classification of the criteria depends on the individual innovation project. An overview of the suggested quality gate criteria for each gate of the EFIPM is shown in Figure 3. 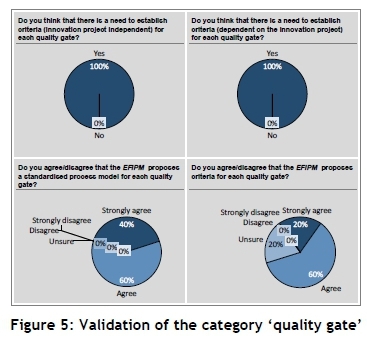 The EFIPM proposes a standardised process at each quality gate that can be used to decide whether or not to proceed with an innovation project. Firstly, it is necessary to check the quality gate criteria, based on their data, the company's strategy, culture, and resources, and the company's environment. The quality gate criteria check reviews the criteria for completeness, correctness, accuracy, and applicability to the individual innovation project. After checking the quality gate criteria, a decision is made whether or not these criteria are fully met. If they are not fully met, the quality gate criteria are updated. If the criteria are fully met, the considered innovation project will be evaluated according to the innovation project deliverables and the updated quality gate criteria from the previous process. The deliverables are the input to the quality gate in order to make a decision . An example of a deliverable is the result of a completed task during a previous stage of the EFIPM . The innovation project deliverables are measured against the updated quality gate criteria. After evaluating the innovation project, a decision is made whether or not the quality criteria have been met. If they have been met, the innovation project is released and the criteria for the next quality gate (if applicable) are established. This means that an action plan for the next stage and a list of deliverables and dates for the next quality gate are generated . The criteria for the next quality gate can be based on the suggested quality criteria. If the quality gate criteria are not fulfilled, solutions for the given problem are developed. The solution development is based on the company's strategy, culture, resources, and environment, and on the activities of the next stage of the EFIPM. After developing the solution, a decision is made whether or not the problem has been solved. If the problem has been solved, the solutions are tested and evaluated . It is then decided whether the solutions have passed the test. If they have passed, the innovation project is released for the next stage of the EFIPM. If they have not passed, solutions are developed again. If the problem has not been solved, the future potential of the innovation project is checked. This process can be based on market information and feedback from customers, for example. After checking the future potential, a decision is made whether the innovation project is viable in the future. If it is viable, the innovation project is put on hold. This means that the innovation project is stored and will be reviewed at a later stage. If it is not viable, the innovation project is cancelled. The three key innovation roles in the EFIPM - the project manager, the innovation leader, and the portfolio manager, who are described in this section - are derived from Essmann, who summarises five core innovation roles by reviewing the relevant literature . The EFIPM establishes a hierarchical ranking order among the three key roles to define clear tasks, responsibilities, and competencies (TRC) in order to avoid misunderstandings. The portfolio manager holds the managerial responsibility for each innovation leader, who manages at least one project manager per innovation project. Szinovatz and Mueller demonstrate the need to establish a role such as that of the portfolio manager, who is responsible for the strategic direction of the innovation processes and thus coordinates the innovation portfolio according to the company's strategy and available resources . Doernemann , Meier , and Mueller-Kirschbaum et al. state that the continuous customer interaction improves the success rate of innovations. Thus the EFIPM establishes an innovation leader who assumes leadership responsibility of the project manager(s) and promotes the voice of the customer internally in the organisation. The current literature asks for an innovation role such as the project manager, who drives the innovation process [16,18]. Thus the project manager pursues the innovation project and continuously demonstrates and refines the concepts. The project manager can be, but does not have to be, the initiator of the innovation project. 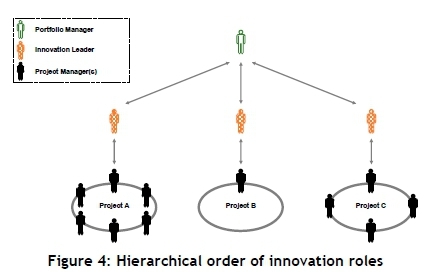 Figure 4 demonstrates the hierarchical order of the three key innovation roles. The requirement for the EFIPM is to anchor the three innovation roles of the project manager, the innovation leader, and the portfolio manager. Thus a clear allocation of responsibilities for each main task is required, as well as the elimination of overlapping responsibilities and responsibility gaps. In order to anchor the different roles in the EFIPM, a responsible, accountable, consulted, informed (RACI) chart assigns process-based responsibilities. According to Lunau et al., the RACI chart method distributes responsibilities to each main task within a project . The benefit of the RACI chart is that it avoids duplicating work and inefficient communication . The responsible person (R) works to achieve the task, and is responsible for its action and implementation . The accountable person (A) possesses the final approving authority, and is able to delegate work to the responsible persons . The consulted person (C) is usually a subject matter expert, and is normally asked before a final decision or action . The informed person (I) is kept up-to-date on the progress, but usually only after the completion of a decision or action . As shown in Figure 3, the EFIPM proposes distinct high-level responsibilities for each stage and gate of the innovation process. The EFIPM consists of seven stages and six gates that in turn contain several sub-stages or sub-processes. In order to achieve a consistent description of responsibilities, each sub-stage or sub-process must also be allocated to the RACI chart, depending on the individual innovation project. Each stage or gate comprises no more than one accountable person and at least one responsible person. Figure 3 indicates letters in brackets for some innovation roles from stage A to gate 2. This means that the different innovation roles can be defined, but do not necessarily have to be. As illustrated in Figure 3, the project manager, if already available, is responsible for stages A and B. From stage C onwards, the project manager is defined and available. This means that the project manager is responsible for working to achieve the tasks and objectives of stages C, D, E, F, and G. Usually the project manager (if available for gate 1 and gate 2) is kept up-to-date on the decisions or actions of all gates of the EFIPM. One exception is gate 4, where the project manager is consulted rather than merely informed. The innovation leader (if available for stage 1, stage 2, gate 1, and gate 2) is accountable for each stage of the EFIPM, but is responsible for all gates. Figure 3 also shows that the portfolio manager is already present from stage A onwards. The portfolio manager is kept up-to-date on the progress of each stage of the EFIPM, whereas the portfolio manager is accountable for all gates. According to Wecht, integrating the customer into the innovation process at an early stage is important for promoting the emergence of innovations, and thus for improving the results . Doernemann , Meier , and Mueller-Kirschbaum et al. state that continuous customer interaction throughout the innovation process increases the success rate of innovations. It is for these reasons that the EFIPM actively integrates customers into the innovation process at an early stage. The strategy of the EFIPM is to ensure the orientation of its processes and responsibilities towards customers, as suggested by Hippner and Wilde . Unlike customer relationship management, however, the EFIPM does not aim to integrate only long-termprofitable customers . The EFIPM includes four different customer roles - the 'opportunity sensor', the 'complementary specialist', the 'specifier', and the 'selector' - that complement the 'lead user' role . Hippel defines lead users as "users whose present strong needs will become general in a marketplace months or years in the future" . This is why lead users are important for future-oriented marketing research. According to Disselkamp, lead users can be existing customers or users of competitive products . The role of the opportunity sensor focuses on effectiveness, and supports the manufacturer in identifying trends at the idea generation/ identification stage of the EFIPM . The typical competence of the opportunity sensor is the use of market-based knowledge to identify opportunities . According to Wecht, the complementary specialist focuses on efficiency, and supports innovation growth by applying explicit knowledge and core competencies such as product-related expertise . The complementary specialist supports the development and refinement of the idea, and has a sound technological knowledge . The specifier supports the specification development in order to develop and refine the idea . As stated by Wecht , the specifier has deep expert technological knowledge. The selector focuses on effectiveness, and supports the refinement of the innovation concept into a development process. The competence of the selector is application-specific market knowledge . The opportunity sensor, the complementary specialist, and the specifier are integrated into stage A, where they provide one-off support. It may also be that the opportunity sensor, the complementary specialist, and the specifier support the innovation project throughout the EFIPM. The developed model integrates the selector into stage B. In a similar way to the three customer roles mentioned above, the solid arrow in Figure 3 symbolises the first integration of the selector. The selector may provide one-off support in stage B, but it is also possible that the selector supports the innovation project throughout the whole EFIPM. The lead user can be consulted throughout the innovation process. All five roles can be integrated at an early phase of the innovation process, and can interact throughout the innovation process from stage A or stage B of the EFIPM onwards. Even though the EFIPM can be applied recursively or iteratively, the process-oriented approach of the FuGle® innovation process model persuades the user to process the innovation project in a sequential way. Figure 3 shows the iterative approach of the EFIPM. Stage A is skipped in this example because the ideas have already been generated and identified . As indicated in Figure 3, stage C makes a loop in order to double-check the concept feasibility and to further refine the concept . Stages D and E may overlap due to disagreements or other circumstances during stage D. It is also possible to skip stage D and gate 4, and to jump directly from gate 3 to gate 5. Stage D can also comprise a technology transfer of innovation projects. A technology transfer passes knowledge from a technology giver to a technology taker . According to Walter , the technology transfer can lead to contract research, licences, corporations, staff transfer, information transfer, training, and further education, as well as counselling. Gresse states that the technology transfer often results in a spin-off company . As shown in Figure 3, gate 5 jumps back to gate 1 in order to make a loop that focuses on different aspects than those attended to the first time. In this example, gate 6 symbolises the completion of the innovation project. Therefore, further exploitation does not seem necessary nor possible for this particular innovation project. The flexible and adaptable EFIPM has no restrictions regarding the temporal order of its elements. It includes jumps, overlaps, and loops, making it adaptable to any situation. Verifying and validating the findings is discussed in this section. The model is verified by comparing it with the requirements introduced in section 3. A precondition of the EFIPM is to synchronise the different roles and to distribute the tasks clearly among each of them. The RACI chart addresses this aspect, and focuses on both the description and distribution of each innovation role. A systematic approach is established through a repeatable step-by-step-procedure that includes methods, techniques, and standardised processes for each quality gate. The open approach enables the user to include external project-related methods and techniques, and is linked to the external environments, which may include open innovation, technology transfer, and customers. The EFIPM also addresses transparent and standardised processes that guide the user through each quality gate, and suggests quality gate criteria that can differentiate between 'must meet' and 'should meet'. Another requirement of the EFIPM is to integrate customers actively at an early stage of the innovation process. This requirement is met by integrating customer roles in stages A or B of the EFIPM. This requirement of retaining an open model for radical and incremental innovations is met through divergent application (e.g., a standard and iterative approach) of the EFIPM in accordance with the circumstances. The requirement to enable flexible application is met by different approaches of the EFIPM that invite the user to make jumps, loops, and overlaps. In summary, the verification demonstrates that all the requirements are met. The EFIPM was validated by five experts through semi-structured interviews using a questionnaire-based survey, according to Meuser & Nagel . The information gathered through the questionnaire survey serves as the research basis for evaluating the targeted contributions of this work. Care was taken to ensure that the interviewees came from both research and business institutions, and that the questionnaire survey was structured into different categories (basic questions, FuGle® innovation process model, research goals and requirements, methods and techniques, quality gate, innovation roles, customer integration, flexible application, and outlook) in order to obtain differentiated results. The questionnaire survey does not allow for representative statements to be made due to the low number of interviewees. However, the results show that an overall consensus was achieved for a major part of the questionnaire survey, with only a few exceptions. These exceptions are explained only when at least 40 per cent of the interviewees disagree or strongly disagree. As illustrated in Figure 5, major consensus was achieved, confirming the need to establish general quality gate criteria that do not depend on the innovation project. General quality gate criteria have to be applied to all innovation projects. A further consensus was achieved: all participants thought that there is also a need to establish individualised criteria for each quality gate, depending on the corresponding innovation project.The participants agreed with the proposed standardised process to approach each quality gate. Eighty per cent of the interviewees agreed or even strongly agreed that the EFIPM should propose criteria for each quality gate. The remaining 20 per cent were unsure whether the EFIPM should propose quality gate criteria. An example of an identified exception is shown in Figure 6. 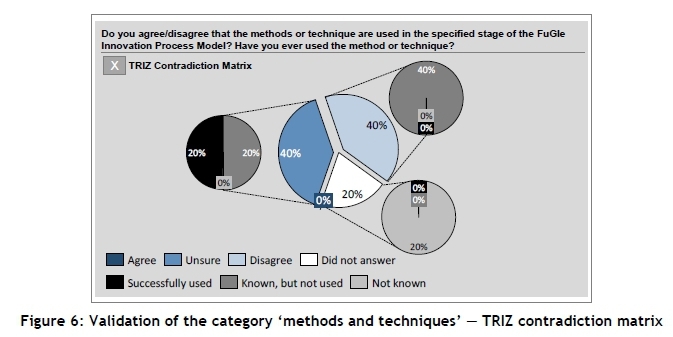 Forty per cent of the interviewees disagreed with the classification of the TRIZ contradiction matrix in stage C of the EFIPM. All of those who disagreed knew but had not used the method. Moreover, the EFIPM only suggests methods to be used in the specified stage. It does not require particular methods and techniques in specified stages. Experienced users can thus freely choose the best application for their individual innovation project. It is for these reasons that the TRIZ contradiction matrix does not have to be revised. On the basis of the verification and validation of the EFIPM, it is concluded that there is no need to revise the model for the following reasons: firstly, it has been confirmed that all requirements are met; secondly, it has been demonstrated that the vast majority agree with the EFIPM; and lastly, exceptions are explained when we include those for which at least 40 per cent of the interviewees either disagreed or strongly disagreed. The discussion of the findings brings out possible opportunities and limitations associated with the use of the EFIPM. First of all, one of the expert interviewees stated that a mix of people with insatiable curiosity and never-ending drive is crucial to driving innovations in organisations. This might lead to the conclusion that the successful application of an innovation process depends on the users themselves. Furthermore, methodologies that generate and commercialise ideas are stated as important for driving innovation. The EFIPM suggests 18 methods and techniques that support the user in driving innovation projects throughout the innovation process. It states that a mechanism to rank and check ideas is essential in order to focus on promising ideas. Thus the EFIPM includes the portfolio analysis, which enables the user to prioritise ideas. A useful extension might be to specify this method according to the needs of each stage or gate and each innovation role. Another participant pointed out that the inclusion of an assessment stage would be a great addition to an innovation process in order to measure the maturity level, profitability, and potential of each innovation project. Even though the EFIPM includes methods and techniques, quality gates, and stage D to prioritise innovation projects, there is still a backlog in the demand for a continuous assessment of innovation projects. In order to realign the innovation project, an expert interviewee pointed out that it is important to present results regularly throughout the innovation process. It is stated by interviewees that the EFIPM restricts the user to iterating the innovation project because of the stage-gate process. A further point of criticism (by interviewees) is that the developed model prevents the user from going back because it is expensive to do so. Nevertheless, the EFIPM invites the user to make jumps, loops, and overlaps. It may be that the EFIPM is not as flexible as non-stage-gate based processes, but it aims to combine the advantages of both - i.e., the flexible application of non-stage-gate based processes and the decision-making guide of quality gates. It is also stated by interviewees that the EFIPM should be kept generic, and should enable different possibilities for access into the innovation process. Even though the EFIPM is a generic stage-gate process, it enables the user to access the innovation process at any time. As stated by another expert, the more structure one adds to something, the less flexible it becomes. Considering this, the developed procedure does not force the user to follow its structure throughout the different instances, but it is useful to have the structure when needed. Another participant's suggestion was to run through the EFIPM as fast as possible in order to make it more flexible. A question that arose from the survey addresses the model-fit for specific industries. Since the adaptability of the EFIPM in different industrial applications has not yet been evaluated, it is crucial to examine the developed model through practical studies. According to yet another participant, a possible drawback of a quality gate is that the user gets stuck in front of it. Even though this problem may occur, the participant stated that it is logical to have gates for decision-making. A solution to this dilemma might be to set out a timeline for each innovation project, and to establish criteria that do not kill an innovation project too soon. The EFIPM has seven stages and six quality gates; and they can be supplemented for specific organisations. For instance, in an early pre-planning stage of the innovation process, quality gates, criteria, and methods and techniques can be added, if required. The limitations mentioned do, however, go hand in hand with numerous opportunities, which can help increase the success rate of innovations. The contribution of this research is embodied in an integrated innovation management process model that enables the user to generate, design, refine, evaluate, deploy, formalise, and exploit an innovation project. The developed EFIPM is a generic innovation management process model that can be integrated into an innovation process of a company in the form of a guide or a checklist. A gap analysis provides the list of requirements to improve innovation process models from quality, customer, and flexibility perspectives. The EFIPM is a synthesis of different methodologies that are applied in research or practice. It serves as a guideline to plan and drive innovation projects. This integrated approach includes highly qualitative processes that are both flexible and customer-specific in their design. The EFIPM presents flexible processes that are supported by different methods and techniques to guide the user in driving an innovation project. Furthermore, the model provides standardised processes and criteria for each quality gate. This innovation approach enables organisations to manage customer needs and trends proactively by establishing different customer roles by introducing customer-based methods and an innovation role responsible for turning innovation projects into marketable products. The developed model synchronises three key innovation roles that are clearly defined. The flexible application of the model enables the use of jumps, overlaps, and loops within the innovation process. It also includes flexible access and exit points. The model components are linked to each other, and aim to increase the success rate of innovation projects. The EFIPM does not force the user to apply its approach rigidly. Methods and techniques, quality gate criteria, and customer roles are provided, and users are free to decide what suits them best. In future the EFIPM should be examined through empirical research and case studies. Its industrial application and adaptability to specific industries is essential to review all stages and quality gates, and to prove its flexibility.